I am going to start by discussing some zone system myths, because until they are swept away, it may be hard to wrap one’s mind around the idea of using the zone system with anything other than black-and-white negatives. So, here goes . . . . Myth #1: The zone system divides the image scale into ten zones. The reality is that it is the exposure scale of the subject that has zones, not the image; and that the zone system itself does not specify any number of zones, because the range of zones represented in the image depends on the photographic medium in use. 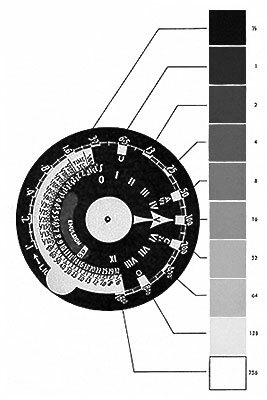 The Gray Scale and the Weston Meter Dial. Note that we use the term zone to refer only to the exposure scale, and value for the other concepts, specifically luminance values, negative density values, and print values. It is essential to remember the basic relationship: if we take a reading from a single-luminance surface and use the indicated exposure settings, we are giving Zone V exposure for that surface, and anticipate a negative density Value V and a print Value V (middle gray) representing that surface . . . . To determine the remainder of the scale, then, we define a one-stop exposure change as a change of one zone on the exposure scale, and the resulting gray in the print is considered one value higher or lower on the print scale. A gray scale of 10 steps seems to me most convenient . . . . Moreover, the 8 intermediate steps of tone can be related to the 8 indications on the calculator dial on the Weston Master Exposure Meter . . . . Ultimately the straight-line response tapers off at the shoulder of the curve (Zone IX and above with modern films). This occurs at high exposure levels and shows graphically the compression of detail in subject areas that are overexposed, frequently called “blocking” of highlights. In other words, black-and-white negatives tend to have about a ten-stop range from threshold shadow exposure to loss of highlight detail. But black-and-white negatives are not the only photographic medium. How did Ansel apply the zone system to reversal materials (transparencies and Polaroid images)? Just which zone we use for the placement decision will depend on the scale of the specific material, and the subject at hand. Both Polaroid films and transparencies have a considerably shorter scale than conventional negative films, however. Few reversal materials will record detail above Zone VII, and even this may be beyond the scale of some. A series of tests should be conducted to determine the practial scale of the film used before deciding where to place important high values which must retain texture and detail. Once you have placed the important high values on the appropriate zones, you must consider where the low values fall. With the relatively short scale of positive materials, Zone II is usually the “threshold” of useful exposure, and Zone III should reveal some substance and texture. So, ten zones are logical when working with black-and-white negatives, but not necessarily any other medium. And trying to arbitrarily fit other media into the ten-zone mold is not likely to be successful. For example, to preview what is to come, placing what is intended to be a textured highlight onto zone VIII when using a digital camera will probably result in disappointment, because many digital cameras saturate to pure white by zone VIII. One last note: the development of black-and-white films can be altered to produce negatives with expanded or contracted range; under these conditions, the number of zones recorded in the image may vary from perhaps 8 to 12. The zone system, when applied to conventional black-and-white negatives, divides the exposure scale of the subject into about ten zones. Table 2. Description of Zones. which some detail is required. Caucasian skin portraits in sunlight. skin, gray stone, average weathered wood. snow with acute side lighting. tured snow; highlights on Caucasian skin. lar glare or light sources in the picture area. Myth #2: This (referring to the table on the right, or a derivative thereof) is the zone system, and these are definitions of the zones. First, note that these are descriptions of zones, not definitions. And, not to belabor the point, this table was published in a book called The Negative. Anyone who professes to understand the zone system should first, in my humble opinion, read chapter 9 of Ansel’s book, Polaroid Land Photography. Even if one has no interest in this (hopefully not dying) art, the book should be considered the fourth one in the photography series for a number of reasons. In chapter 9, “Exposure and the Zone System,” Ansel applies the latter specifically to Polaroid materials, step-by-step, and compares the results with the familiar ones known from black-and-white negatives. This is an invaluable source of information from which to glean the basic principles of the zone system, independent of the photographic medium in use. Figure 9-7 below should be an eye-opening experience to anyone who has so far only understood the zone system as applied to black-and-white negatives. Ansel then points out that many Polaroid materials actually have a much smaller dynamic range than that illustrated in the figure. To find the contrast scale of the Polaroid material, we count the number of textured zones (prints) between darkest and lightest, then add two (for the darkest and lightest). If, for example, six textured prints appear, we assume the material has an 8-zone capacity or range . . . . Type 52 Polaroid materials have a total of only about seven zones. As we begin to realize these differences, we begin to understand that the zone is an elastic unit. We will see later that Zone III in Polaroid is darker than Zone III in conventional materials. When we generate both rulers from Zone V, we definitely see that the Zone III in Polaroid is darker than the Zone III in conventional B&W. For visualization this means that we have to adjust our mental idea of, say, Zone III, according to our experience of the film in the camera. So, to correct myth #2: the table on the right is not the zone system; it is the result of applying the zone system to conventional black-and-white negatives. The full black-to-white Polaroid scales usually span an exposure range of 1:16 to 1:48, Zones II-III to VII-VIII½. With conventional negatives the effective exposure range is 1:128 or 1:256, Zones I through VIII or IX. Only Value V remains constant throughout, and we visualize the other values in reference to the exposure scale of the film in use. Print Values IV, V, and VI will be quite similar with Polaroid or conventional materials, but Value III in a Polaroid print is not the same gray value as in a conventional print. In visualizing the values of the Polaroid print you must adjust to its restricted range, which is comparable to that of color transparency materials. Through experience you can learn what Zone III represents in a conventional film and in Polaroid print films, and visualize results appropriately in reference to the material (see Figure 9–7). Myth #3: The zone system requires variable processing of the negative, and therefore cannot be applied to other media. Full control using the Zone System requires individual processing of each negative, obviously not practical with roll films. It is a mistake, however, to assume that the Zone System therefore “does not work” with roll-film cameras; since it is a practical expression of sensitometric principles, the Zone System remains valid, even though its use is somewhat different . . . . While the Zone System allows considerable freedom to control the process to achieve our visualized objectives, we also learn to visualize images within the limits imposed by the process, regardless of format. The Zone System procedures described apply to the use of conventional black-and-white negative films, and with modification of scale, to color negative films. Reversal films (that is, those which produce a positive image directly rather than a negative) call for a somewhat different approach. Such films include transparency materials and Polaroid Land prints. I have found that the Zone System is invaluable in color photography, primarily in relation to exposure, but of course its application poses very subtle considerations. The two exercises above [Polaroid exposures] are fairly simple and, if repeated several times, generally give the student a taste of the consciousness-expanding power of previzualization. He may also soon learn that previsualization is the ultimate benefit of the Zone System, not contrast control, as is popularly thought. If the positive film is developed automatically, contrast control through the alteration of film development is gone. So we previsualize with what control is left—changing exposure. If even that control is taken away, as in fully automated cameras, we previsualize according to the inherent contrast of the film . . . . We can flatly say that no combination of film, camera, and processing denies photographers the choice of visualization. Myth #4: The zone system cannot be applied to advanced imaging techniques such as High Dynamic Range (HDR) imaging. The zone system is ideally suited for HDR imaging. See the More Examples page for two HDR images captured using the zone system. Side note: is the zone system a part of the printing process? What he never does is describe the making of any print in terms of fixing image elements on any specified value (or zone). What he actually refers to are qualities such as brilliance, texture, luminosity, the separation of values, and logical relationships. I have found that many students read descriptions of procedures in a rather strict way, and are then consumed with the effort to produce exact relationships between subject luminance values, negative densities, and print values. No matter what he does, the photographer cannot violate the principles of sensitometry, but sensitometry is a tough discipline and will tolerate a good amount of bending without breaking! My work, for example, is frequently regarded as “realistic,” while in fact the value relationships within most of my photographs are far from a literal transcription of actuality. I employ numerous photographic controls to create an image that represents “the equivalent of what I saw and felt” . . . .
Making the print was much more difficult than determining the negative exposure. The visualized values for both sunlit and shadowed areas required luminous local contrast for the shadows and a bright but textured value for the sunlit shape. The basic information was in the negative but required considerable enhancement in the print. (A) In an early work print the white stair wall, illuminated by a window at the far right, does not seem logical, even though it is quite true to the subject. (B) In the best work print, I have burned down the wall to an agreeable and logical value . . . . I will assert that the zone system is primarily an exposure technique that is used during image capture to ensure that all visualized subject elements are recorded in the image. During the printing process, whether in the wet darkroom or in Photoshop, dodging, burning, contrast adjustment, and so forth are used to create the final product based on how image elements look in relation to the rest of the print, not where they fall on a predetermined value scale. This is what Ansel meant by saying that the negative is the score, and the print is the performance.